Comet Clutch 219554A - Torq-A-Verter Drive Clutch - 1" Bore. Replaces Manco 8190, Comet 203603, 203603A, 219554. Also fits Comet TAV2 30-100 and GTC Torque Converters. Home > COMET INDUSTRIES BELTS > COMET 203596A BELT REPLACES 994-105 Comet 30 Series > Comet 219554A Go Kart Clutch. Drive unit. 1" Bore. Replaces Manco 8190 and TAV2 clutch. Genuine Comet 219554A - Torq-A-Verter Drive Clutch Unit, 1" Bore. Replaces Manco 8190, Comet 203603, 203603A, 219554. Comet 219554A Go Kart Clutch. Drive unit. 1" Bore. Replaces Manco 8190 and TAV2 clutch. Comet Clutch 219554-A Genuine COMET Item. NOT AN IMPORTED KNOCK-OFF! - Torq-A-Verter Drive Clutch - 1" Bore. 1/4" Keyway. Replaces Manco 8190, Comet 203603, 203603A, 219554. Uses 3/4" Wide, Asymmetric Drive belt. Great for machines that require extra-rugged driving ability. 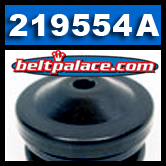 Replaces those found on Go Karts, Boonie/Mini-bikes, LTV's and grounds maintenance equipment. Also fits Comet TAV2 30-100 and GTC Torque Converters. Made in USA! Hardware and Instructions Included. Comet 219562A. Driver Fixed Face and Post for Comet 30 Series/TAV2 Kit. Comet 219562A. Replacement Drive Clutch Fixed Face and Post for Comet 30 Series/TAV2 Kit.